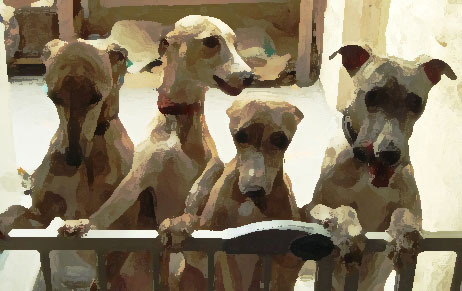 In never ceases to amaze me how nimble our whippets are when they are leaping 30” (76cm) effortlessly from a standstill up onto their bed on the table yet never leap to freedom over the child gate – which is clearly within their capability. When they want to get our attention they put their front paws on top of the gate and pogo. This is a great way of letting us know they want to go out / have a cuddle on the sofa / or are just bored and want some fun. N.B. If you are squeamish, please turn away now as I am going to talk about excrement. It is a sad fact that my very existence has been defined by poo. It is the one constant thread that has run though my life. I have been clearing up other people’s poo….human babies, rabbits, guinea pigs, hamsters, horses, cats and dogs, for as long as I can remember. (Does this sound familiar?) 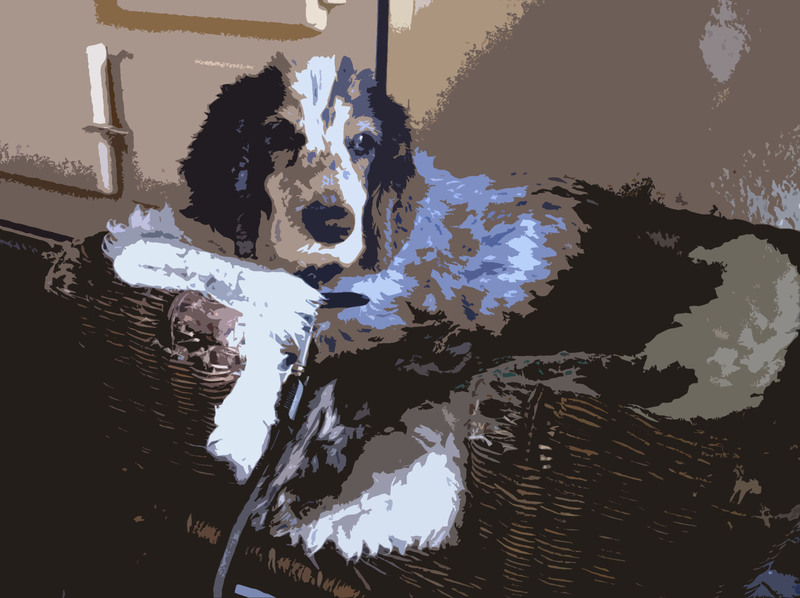 It would make a good epitaph: Caro, sadly passed away, has scooped her last poop…..
We don’t talk about it much in polite circles but it’s a fact that our pack are really good at ‘recycling’. 5 dogs = a lot of deposits! Sometimes, with them all performing at once, its a task (I was going to say job) to get to the walnut whips (plus an occasional cat poo if the neighbours cats have been brave enough to venture into fearsome hunter territory) before some of them are hoovered up by the rest of the pack. We haven’t trained them to do this….they do it all by themselves, despite the fact I was really vigilant about clearing up after them when they were pups in the hope that they would not get into the habit – to absolutely no avail. It seems some dogs do it and others don’t. Perhaps it goes with the genes. This sort of behaviour is totally repellant to our sensibilities but clearly not to them, particularly if their last ‘snack’ happened to be a juicy bone! There must be some nutritional value in this otherwise they wouldn’t do it, and to be honest, I am not so averse to them eating their own poo – if they must – it’s everyone else’s poo, plus any accompanying stomach flora and flora, I object to! And they are not fussy. Badger, fox, cow, horse, dog, bird…..you name it. If it doesn’t go down their throats, they will rub their necks – and collars – in it as if it was Chanel No5, and then parade around pleased as punch. Dogs! Who – in their right minds – would have ‘em? Martha, our labrador, loves all types of poo as well – and it’s a constant battle to try and prevent her from finding cat, rabbit, and worse! I once heard that dogs who eat omnivore / carnivore poo are lacking something in their diet. But as Martha is a spoilt dog, who has James Wellbeloved complete food – plus fresh fruit and veg – I can’t believe that is a trueism. Rather, as you say, some dogs do poo, some don’t! For whatever reason, they are obviously designed to do it and their guts are able to cope with all sorts of ‘rubbish’. Just imagine us trying to eat a whole animal bone? My dogs love rabbit droppings especially and hoover them up like smarties!